Tell me – when was the last time you heard of a band using a drum kit made up of miscellaneous remnants of three separate washing machines? Unless you’re privy to a secretly unreleased Lou Reed project, I would hazard a guess of never. 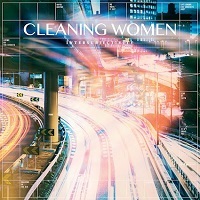 Enter Cleaning Women. When not scoring silent movies or documentary projects, this Finnish trio spends their time raiding their local scrap yard for instrumental inspiration. As was the case with their previous album, 2009’s ‘U’, every piece of equipment implemented on follow-up ‘Intersubjectivity’ is its own DIY revelation. Thus, along with the laundry paraphernalia we have a bass comprised of three-string clothes hangers, inverted coffee making utensils as well as a plethora of other Frankensteinian creations featured. This goes a long way to explaining the startlingly unique sonic quality to the tracks found here. However, you’ll fail to pinpoint any overarching genre to ‘Intersubjectivity’. From post-punk to industrial, from French balladeering to German techno, the breadth of the musical canvas is rather vast, to put it mildly. Opener and lead single ‘Playoff’ is probably the least daring inclusion, yet the instrumental track is propelled by an effectively simple melody line and reacquaints us with Cleaning Women’s penchant for percussive ingenuity. The dark new wave of ‘Leap Of Faith’ provides a glimpse into the band’s more ominous tendencies, whilst still boasting a tremendous sense of urgency and pace – imagine if Depeche Mode had a crack at Black Sabbath’s ‘Children Of The Grave’ and you’ll get some semblance of the song’s impressive electro-galloping coda. ‘Shadows In The Air’ and ‘Life Among The Concrete Dust’ both bear the influence of Sergio Leone with their futuristic Western vibes; the former combining that with a Roger Waters-esque vocal delivery, the latter exuding bombast with a gothic choral section. The moment of peak ridiculousness arrives with ‘Living In The Streets’. This ode to the plight of the homeless begins with a spoken word passage in the style of Tommy Wiseau meets Fred Smith, before catapulting into a carnival section that Killing Joke would envy. It’s absolutely preposterous, and yet somehow it all works – which, incidentally, is a rather fitting summary of the album as a whole. Although it’s very early days, 2019 will have to go some way to deliver another album as diverse and identifiable as ‘Intersubjectivity’; with enough experimentation to keep the art rock fan happy as well as plenty of hooks for those just looking for their next earworm. ‘Intersubjectivity’ is released on 15 February. You can get your copy HERE.